“While getting JDBC connection in java application what we do is first we call Class.forname(“<driver-name”) and then we call DriverManager.getConnection with appropriate arguments. We do not get any value from Class.forname and return it to DriverManager so how this works. So now let’s see what happens when we call Class.forname on JDBC driver for MySQL db. Following is code snippet from MySQL driver class. Looking at the code we understand that Class.forname will call registerDriver method of DriverManager class and will pass instance of Driver class for MySQL to DriverManager. When DriverManger.registerDriver is called it will check for null and if it is not null then it will add this driver in list of registered drivers. When getConnection(url, user, password) is called it will internally call getConnection(url, driverinfo, classLoaded) which will iterate through registered drivers and call connect method on Driver for which which will create and return connection. // If the caller does not have permission to load the driver then skip it. One of the best practice for developing application is Test Driven Development. Common most tool/api we use in Java for unit testing is JUnit and for automation we use is Ant. Ant task for JUnit supports four result format. So we create a java project in Eclipse and add these jars in build path and create following class in java project. Let’s understand the code now. We will define following class level variables to store status of test cases. testsuccess will be set to true if test case is executed successfully. If test case fails then addFailure(Test t, AssertionFailedError e) will be called and we will set variable testsuccess to false. Default value of isError will be set to false and if any Exception/Error occurs while executing test case then addError(Test test, Throwable t) will be called and in this method we will set isError to true. When we implement org.apache.tools.ant.taskdefs.optional.junit.JUnitResultFormatter interface we need to implement following methods. addError(Test, Throwable): As explained this method will be called when any error occurs while executing test case. We will set isError to true if/when this method is called. addFailure(Test, AssertionFailedError): As explained this method will be called when any test case fails. We will set testsuccess to false if/when this method is called. endTestSuite(JUnitTest): This method will be called at the end of Test suite. We will use this method to write result of all tests in csv file. setOutput(OutputStream): Output stream as defined in ant task will be passed as an argument. We will store this as handler to local variable to use it later for writing our test results. setSystemError(String): This method is not used in our case. setSystemOutput(String): We are not using this method either. Here we are using a very simple JUnit test case for employee registration. Where method accepts data in form of a bean and registers employee. 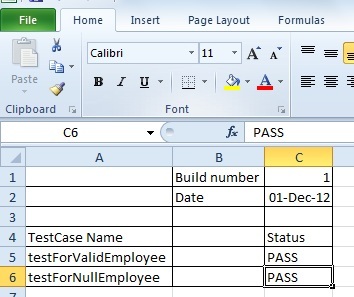 If passed bean is null or values passed in bean are invalid then it will return false and if bean is valid then employee will be registered and method will return true. So following will be test class. So this generated data was stored in following format to track results of each build.